Arizona Game and Fish Department personnel conducted a spot-check electrofishing survey on Redondo Lake near Yuma on Nov. 28. 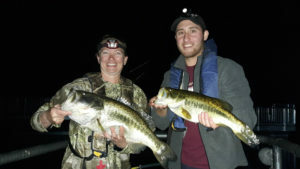 During pair of 15-minute electrofishing sites, 24 largemouth bass were caught, including a very nice 19.3-inch, 3.7-pound fish (right-above), and a 22.7-inch, 8.2-pound lunker largemouth (left-above)! 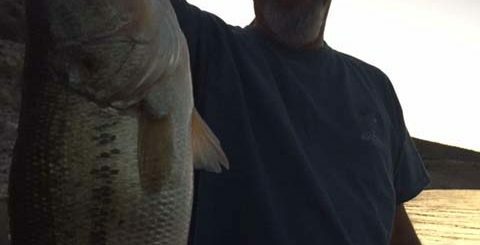 Overall the population appears to be balanced and healthy, with larger bass for anglers to catch today and smaller fish for anglers to catch in the future. If you would like to fish Redondo Lake, it is highly recommended that you use a float tube, canoe, kayak, or other small vessel with a single electric motor for propulsion only as there is little shoreline access to the lake other than one fishing dock. For directions to Redondo Lake or any other Yuma area waterbody today, please consult the Yuma fishing holes brochure.